I’m the last person I ever imagined would join a bee club. At the age of seven I was stung by a bee in our back garden and my leg blew up like a tree trunk. It was a horror experience and sadly the catalyst for a life-long irrational fear of these magnificent creatures. Forty years later balcony gardening has mostly cured me. I quickly discovered without these industrious little pollinators nothing was going to grow in my garden. And then more reading and research made me realise how dire things were for bees with the Varoa destructor mite and Colony Collapse Disorder seriously threatening the future of bees colonies around the world.And the scariest statistic – we are so reliant on bees to pollinate our commercial crops that if bees died out the human race would follow two years later! Enter the Sydney Bee Club – a wonderful initiative of Doug from Sydney’s the Urban Beehive. Doug establishes hives all over urban Sydney… on roofs, in back yards, behind restaurants. Urban hives will assist with pollination and protect the diversity of wild bee populations. 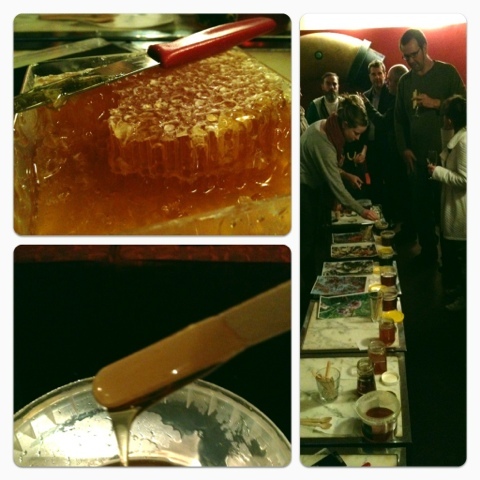 Last week the Sydney Bee Club met at the Lord Roberts pub in East Sydney for an extraordinary evening of honey tasting. The flavour of honey is affected by the type of nectar bees collect and the seasons. Some honeys were pitch black and smokey and treacly. Others were clear and light and floral. My favourite was a honey from Double Bay. Delish. With our new hive of 10,000 bees settling into their new home on the roof of the Wayside Chapel I’m looking forward to discovering more about the humble bee. This entry was posted in bees on August 5, 2012 by dearindira2013.